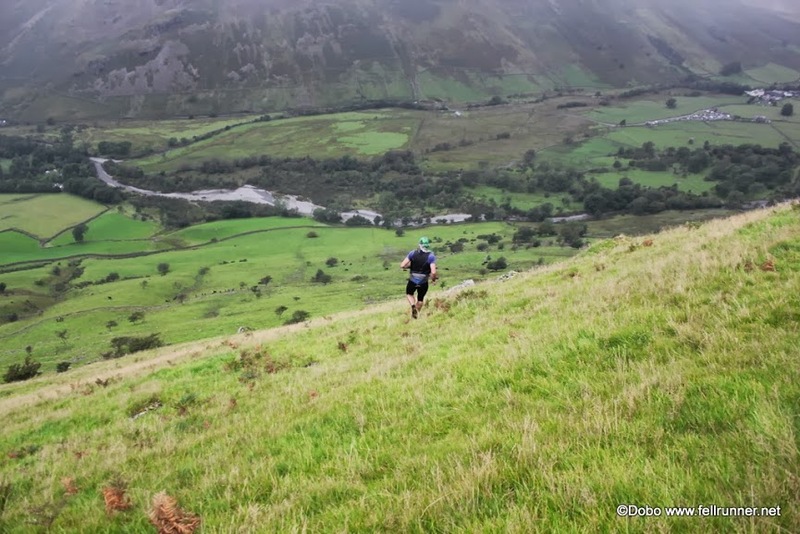 In the spring or summer I hope to do a bit of trail or fell running somewhere in the UK. Never done it before. I’ve only taken in occasional steep hills or undulating countryside. 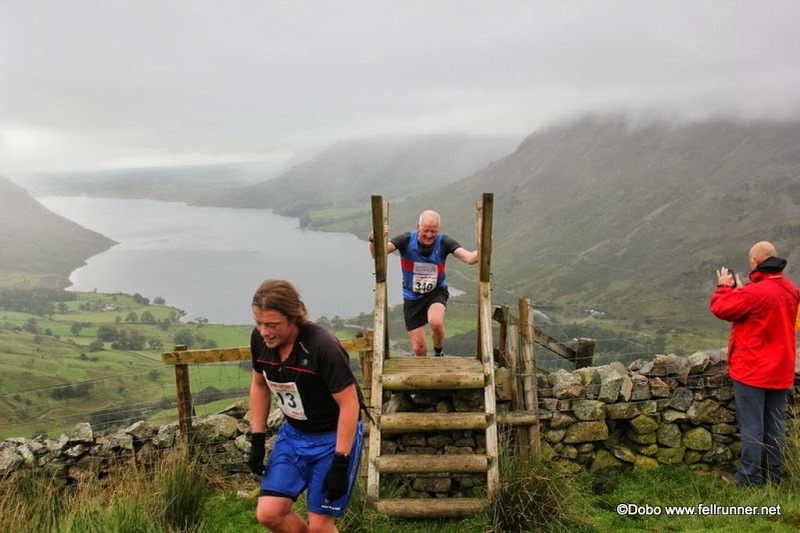 We’ll probably try to identify a race that’s manageable for an inexperienced fell runner rather than opting to run up and down something that should be tackled with ropes, crampons and ice axes. Nor do I want to be in a race with ultra tough looking fell men that eat ice when they need a drink and run up as fast as they run down. There must be something suitable for a soft Southerner (living in the East). I’m currently doing a screen printing course for complete beginners, during the daytime, in a local college. It’s in a large art room/studio full of much used art equipment, paint stained sinks, racks, screen print benches of varying sizes and everything to support multi media. Second session tomorrow. It’s a bit like being back at school but more relaxed and with a benign teacher. Another night time run. Didn’t really feel like it initially. After 5 minutes I came alive and felt much more alert and energetic. That’s the thing with running – it wakes you up! Parkrun on the weekend. We’ll do Wimpole Hall Estate. It’ll be muddy and slow but we’ll be with friends, have a nice mug of coffee post run and the bookshop will beckon. Heaven. 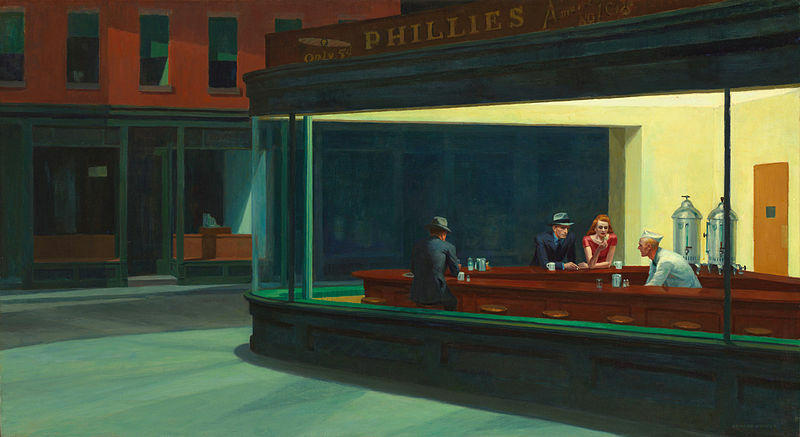 Compare and contrast my image of urban alienation and ennui with Edward Hopper’s Nighthawks (1942) (courtesy of Wikipedia). I think Edward has the edge. I battled the elements (bitter wind, biting rain, threatening snow and, worst of all, dull, grey light, to triumphantly enter Cambridge city centre, aided only by my bus pass and a steely sense of purpose. 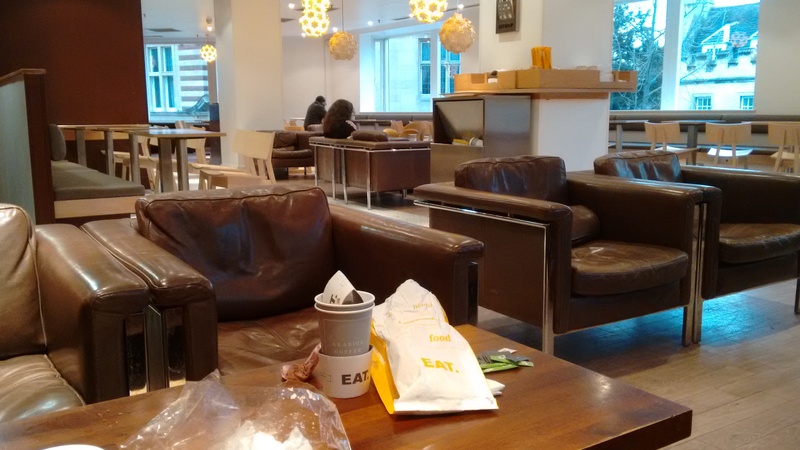 I transacted my business, got freezing cold and then repaired to Eat, the sandwich shop chain where I hunkered down and ate an up market tuna and cucumber baguette. It was rather squidgy (Lorna wasn’t there to throw up her hands in horror) and I made a mess but no-one noticed (obviously because they are wallowing in urban alienation etc and that kind of thing goes over their heads). I do like Eat. It’s anonymous, unpretentious, not expensive, reasonably comfortable and I can concentrate to read, eat and drink coffee. I then went to Cambridge Central library and saw this on display. Reader, I borrowed it! 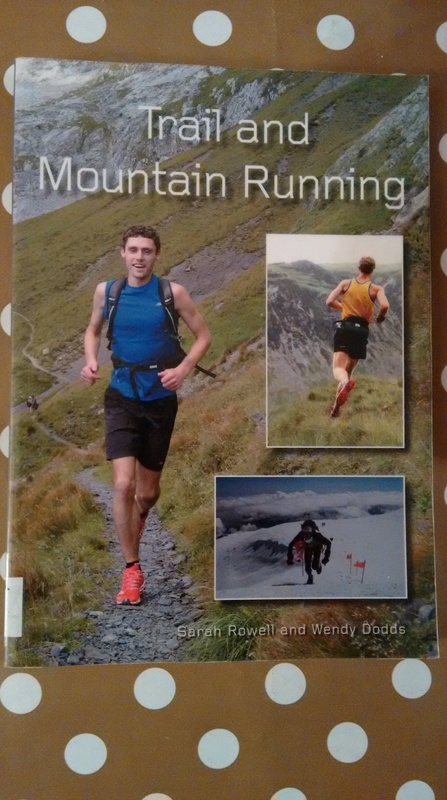 I can only fantasise about fell running locally. Cambridge is flatter than the flattest pancake. I am managing to run each day for Janathon although 4-5 days in the week are just 2 milers. The mild winter in Eastern England has now got appreciably colder and I’m now running in trackster bottoms and a mid cold protection running jacket. It’s about 2-4c at the moment but minus centigrade temperatures will soon be upon us and I’ll wear a heavier duty cycling jacket which I keep on even when I’ve warmed up. Alan Rickman’s death was announced today. Another very sad event. A great and entertaining actor, gone at 69. Fell running looks a lot of fun but where I live in Cambridgeshire, it’s as flat as a chapati (Indian flatbread for UKIP supporters who don’t get out much). We’ve got a few very minor hills which might be a few feet above sea level but nothing approaching a fell. I would have to travel to the Peak National Park, just over 2 hours drive away to encounter some real hills and further North to the Lake District and Cumbria to be spoilt for choice (I’m not even sure the Northern tribes allow soft Southerners to run up and down their hills without permission or a permit. Anyway, let’s suppose I’m free to run and the North-South divide is not held against me, I’d love to do it. I’m currently reading Richard Askwith’s Feet in the Clouds 2004 book on fell running and also bought his recent book, Running Free. It’s enjoyable and I find it motivational. The problem I have with descriptive writing of this kind is the unremitting focus on superlative performance and shock and awe at the level these runners are performing. And, so far, it’s mainly about men – their courage, stamina, strength, devil may care attitude, seeming indifference to risk, unbelievable descent speed, affinity with the rugged terrain blah, blah. They are all legends which we mortals can never join but only adore from afar. That’s the problem with most books on sports activities ( I am presuming this because I don’t generally read them). The focus is on the fastest and the the winners, the dramatic stories, the poignancy and the pathos. It’s not on the also rans, the runners in their 50’s, 60’s, 70’s and older who are still tackling the hills albeit much slower or running less distance or less demanding courses. Cambridge parkrun (5k) today. I did it in under 24 minutes again but I thought I ran faster than my actual time. Perhaps I had earlier disrespected the Gods and they took their revenge by manipulating the passage of time to ensure I took longer to complete the distance. Two days ago I ran a club members only 5k (with four other clubs competing) and did less well. Over 200 took part and I was hemmed in at the back resulting in a slow start. Additionally, it was an evening race and I am a morning runner by choice, a flock of black crows crossed my path and to top it all, the goddess Aphrodite whispered in my ear “This isn’t your race, Steve” just prior to the start. After parkrun today, I rested for a couple of hours and then I went for a 13.2 mile run along the river Cam. I haven’t been for a long run for weeks. Instead I’ve been doing lots of short runs and races. I took a chance and ran 13 miles straight off and it went OK. As usual the water nymphs along the banks of the Cam tried to lure me into the water and I had to call on my reserves of willpower to resist their blandishments. They were very alluring and it was probably the fact that I was wearing Lorna’s Garmin that swayed my decision not to jump in (note to self : are Garmins waterproof or only showerproof ? ).